Through Varsity, TradingQ&A, and Z-Connect we have continuously tried to share as much knowledge as possible. After 8 years as Zerodha and interacting with lakhs of investors and traders, there is still a lot to be done to empower/upskill people through education. We have hence partnered with LearnApp as part of our Rainmatter initiative in our quest to broaden financial literacy. Find below a post by Prateek (Founder, LearnApp) introducing the platform. I am also extremely thankful to all the industry leaders who readily agreed to share their knowledge without any expectations, just with the objective of helping others. Some of the things shared is #Gold, I hope all of you enjoy learning from LearnApp as much as I did. What if you could learn from the Chief investment officer of ICICI, Aditya Birla or IDFC? What if traders could learn from hedge fund managers managing hundreds of millions of dollars? With LearnApp, you now can. Enrol @Rs. 375 per month (charged yearly) or Rs. 500 per month (Charged 3 monthly) to access all courses and live classes. To learn more or visit learnapp.co. There exists a skill gap between our college education and the real world. LearnApp fills this gap. Industry leaders teach real-world skills that we cannot learn in any institution. LearnApp is our attempt at building world-class video courses and live classes at an affordable price. Naren shares what strategies worked and what did not in his career in fund management. He teaches value investing with a framework you can use. 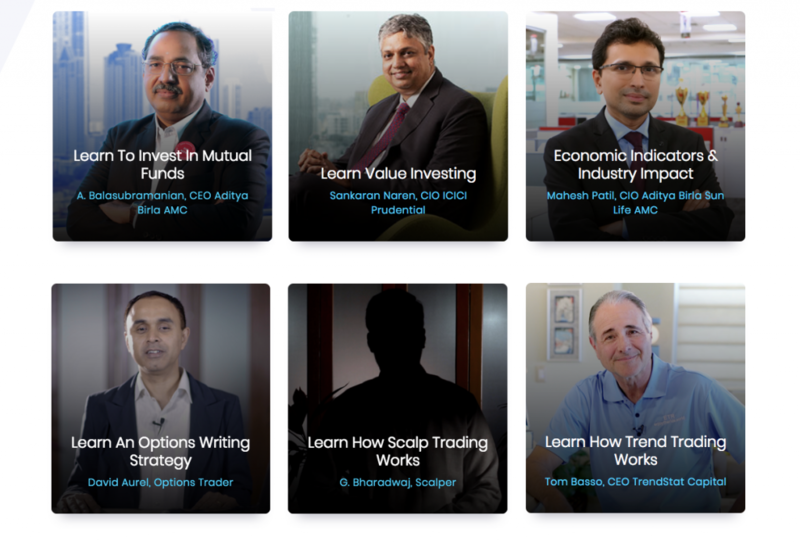 One huge pro of this course is that you get a ready framework to apply to your investments. One con is that value investing is a slow process, you need to have patience. When I first started trading I would try to find stocks that would react to oil, inflation or GDP numbers. Back then It was a bit difficult since I didn’t understand the implications of the economic data. This course not only explains each indicator but also its impact on sectors. One huge pro of this course is that you can pinpoint sectors that will react to the upcoming news. One con is that you will have to find the stocks yourself that lead a sector. The first Book I first read as a budding trader was Market Wizards by Jack Schwager. Tom Basso was one of them, I am proud to say that he has built an amazing course on trend trading. A huge pro for this course is that they teach in Indian stocks as well. It is expected in September that he will take a live class as well, get ready! In and out within 60 seconds. That takes some skill! G. Bharadwaj shows stock selection, entry/exit criteria and risk management. One pro of this course is seeing a unique trading style, after all, Bharadwaj has won the 60-day Challenge 10 times in a row. One con of this course is that the stock selection criteria could be taught in more detail, to mitigate this Bharadwaj is taking two live classes. Learning happens only when there is a feedback loop. Once you learn, you must revise. To do this we have an interactive quiz with a timer. Soon we’ll release an update where you will experience quiz with charts/graphs and analytics on your learning progress. 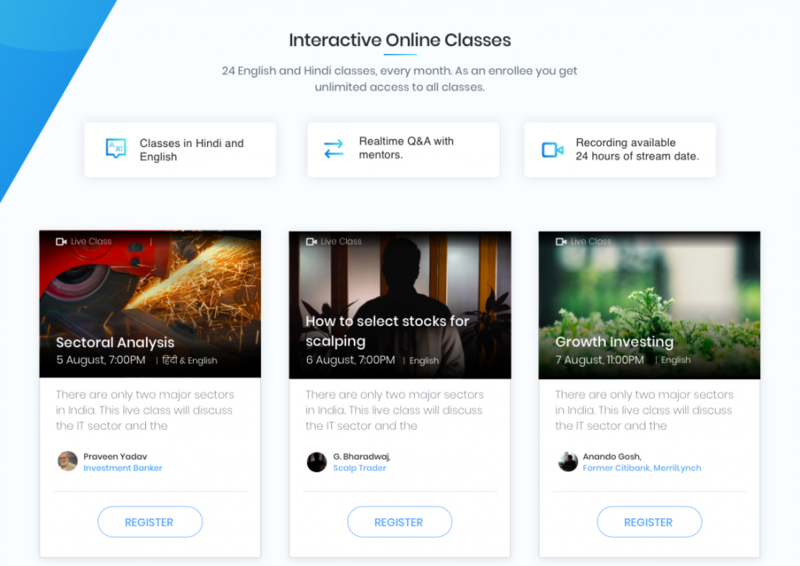 Live classes offer a platform to interact with mentors realtime. A live chat two-way communication with the mentor on voice stream. These classes are intermediate to advanced and must be attended after you take the relevant video courses. LearnApp will conduct over 24 live online classes in Hindi/English on Trading & Investing in August. The mentors try their best to read the live chat and answer your questions on the spot. The lineup for August can be found here. Enrol to access all courses and all live classes. Nothing is charged after you enrol. All courses being dubbed in Hindi by artists working with National Geographic and discovery. Apart from working on new trading and investing courses, we will release a series on Entrepreneurship too. The best in the country are participating. In our quest to create the best content possible we are filming additional video courses with IIM professors. Commendable . Something of this kind was really needed which would encourage people to learn about the markets and gain insight from expert investors and traders. Hey Shivam, thank you for the encouraging words. What courses would you like to see on LearnApp? Thank you Sharma ji! We hope we can keep pushing out new courses and making the platform even better. Can live classes will be available in recorded from so that we can see letter ….?? हर महीने क्‍या Same Class ही Repeat होगी क्‍योंकि अगर हर महीने Same Class Repeat होगी, तो फिर 3 महीने या पूरे साल के लिए Enroll करने का क्‍या फायदा? sir can i enroll this scheme for 3 to 4months? Prateek and Nithin. Kudos. You people are real Game changers and disruptors of Indian stock market space. These kind of works were long awaited. Thank you Tarang! How long have you been trading? Looks like there is some error in this.. Pl correct it..
Hiii if i want one month then Is it possible ??? You will benefit from the live classes too, do take the Tom Basso course on trends to start off with. क्‍या अलग-अलग Courses के लिए अलग-अलग Pay करना होगा या एक ही Payment से सभी Courses में Enroll हो जाएगा? Wow!! This is very helpful for all the investors. Especially for the beginners who can become more knowledgable with your sessions!! THATS A VERY GOOD INITIATIVE. I WILL ENROLL. WILL HELP MANY MANY TRADERS / INVESTORS. Thank you Nagaraja! I hope you enjoy todays and Saturday’s live classes as well. Hey ashish try again in Chrome. LearnApp.co has issues with running on internet explorer. Just want a TEST of the COURSE. Is there any FREE DEMO Session so that I could make my mind to enroll in the 3 months course and if I felt it useful, I would sure like to join for 1yr and then for Life Time. How can I get a FREE DEMO CLASS? Hey Sougata! Thank you for your supportive words. How to attend video classes…any link…? Yaa youtube… webinar..? Hey Bhalesh, visit learnapp.co and signup after you enroll you can access all the video courses and live classes. Is there any Android app to see the videos and follow the classes ? Hi I have a doubt here ,If same classes are repeated everymonth ( u mentioned in above comments ) what is the need to listen it everymonth ? We introduce new classes as well. But since most learners usually are unable to attend all classes we repeat the classes. Also for topics such as trends we can show latest developments so each class is unique since markets are ever changing. The advantage of live classes, I think is that the market data is latest and some of your questions can be answered on the spot. GRAND! Get the best to share their insights. And keep the fee low so it benefits all segments of the society. That is how trading can be made more popular and democratic. Congrats on a good initiative. You got it Santosh! spot on. Now we need to get more courses up fast! Quite a commendable step, which was so essential. Would love to have modules on “Options Trading” as an essential part of the course!!! on this topic. We’ll try to get a video course up too soon. The concept which you have introduced was something which was needed from Zerodha. It separates you from other traditional conservative brokers where they opened account,give rubbish research calls, charge you hefty brokerages and lack customer service. Thank you for the encouragement Pulkit. We hope, we live upto your expectations. Looking forward to seeing you on Learnapp. We are an online platform, so you can access it from anywhere. Head on to learnapp.co to join! Thank you for reading. Looking forward to seeing you on LearnApp. We would like to inform you that G.Bhardwaj is also taking a live class this saturday i.e. 11.08.2018 at 11 AM. So if you want to learn this strategy, you should go through the video lesson and then take the live class. Thank you for reading. see you on LearnApp! Nice initiative from Zerodha. What will be timing for Live classes? Will it be there in weekends? Please do all training in Hindi or Marathi specially for Intraday trading. Thank you for your encouraging words! What do you think should be the next courses on the list? Sir, Is there any chance to translate Tamil? No plans yet Jayakumar. However, if we have enough requests for converting the courses into tamil. We will definitely consider it. This is a good initiative. However, would you please help me understand the annual charges mentioned above in the article. Rs. 325 per month for 12-month enrollees. (Rs. 4500 +GST)? Rs. 325 X 12 months = Rs. 3,900 + GST. Your calculation says Rs. 4500+GST. Would you please give the exact figure? My post was incorrect, apologies for the confusion. Let me know if there are anything else we can help you with. Isn’t there a free trial offer period, like most of your services have, initially? You guys have been good, I really enjoy reading Varsity. Unfortunately there is no free access for anyone, however please attend our live class session on Saturday 11th August 11AM (this one class is free). Definitely will be there! Cheers and Kudos to your team! I’m with Zerodha since last one year. Thanks to Zerodha for providing a useful platform. Being a technical person I couldn’t understand some key words and unable to make full use of this platform. Hence it’s my opinion if Zerodha providing a face to face interaction training program for beginners. The live classes are are 2 way interactive session with the mentor. So you can ask them questions directly which will be answered. would definitely love to enroll. pl advise by mail how to enroll and in addition to the videos , will there by pdf books/reading materials sent to enhance the learning. To answer your question, yes we have PDF reading materials for the courses as well viewable online (not downloadable). If you have read the blogpost, you will know that in the coming months, all the courses will be in Hindi. Good news for you, I hope. How about attending to webinars selectively say like Tom Basso and of my choice only. Can you make some provision if I choose to attend. Anyway you collecting the money first. Reminds me “Money is more than God”. Hello Zerodha, currently i am giving CA exams so won’t be able to apply for now… Can i start this after November? Will i miss anything?? You will miss a bunch of classes, but in the long term it doesnt matter! All the best for your exams, I’m sure you will SHINE! Great work. 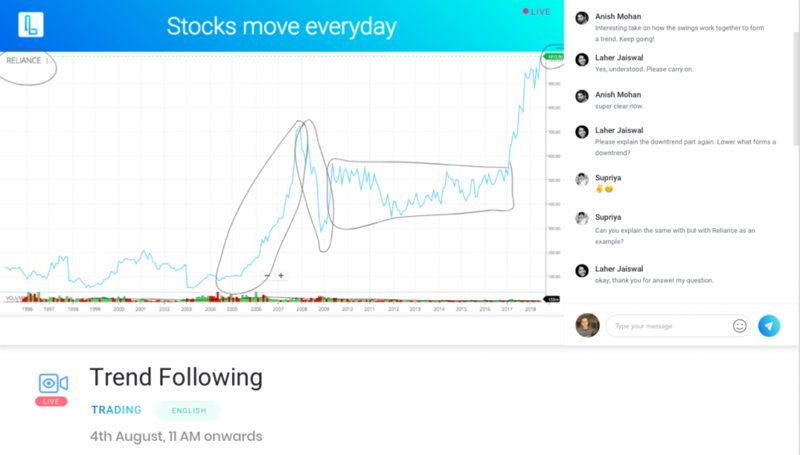 Industry really need something of this kind which would encourage people to learn about the markets and gain insight from expert investors and traders. Also pls guide if partner can get any benefit from refferral. Keep it Up as Zerodha Team is a Game changer. Yes the idea is to encourage new investors and traders to begin investing properly. We hope we can inspire people to begin doing this in a systematic way. For partnerships please email [email protected] – we have a very good referral programme for you to use. ” BEST WISHES ZERODHA TEAM KEEP ROCKING “..
Super Effort please carry on…. This Live Classes- Cost also Very Very Affordable for me better than Other Mentors.. Thank you for your kind words. We look forward to seeing you in the live classes. Can i connect using Zerodha details? its forwarding to wordpress site. Let me know where n how to login using kite login n pw. You do not need a Kite login to use LearnApp. Simply go to learnapp.co and enrol. Simply visit learnapp.co or write to [email protected] for any questions you may have. Are there any trial of the classes and do you assure cashback if not satisfied. How long it might take for a beginner to make a profitable intraday. For a beginner to be profitable intraday is a tough question. I dont think just taking our courses is enough, it is probably only 30% of the journey. The rest is about patience and discipline to trade ons strategy for a long time and actually following it. Thanks for the reply Prateek. May I know how to enroll for the free class held on Saturday? Hi..Firstly it’s amassing to hear that top market expert will teach us there GURU MANTAR to be successfull in stock market, so thanks to team zerodha for such an effort. 2) Will there be class on how to read the chats, how & when to use lagging and leading indicator’s, candle stick pattern, etc. I checked the value investing course and saw the introductory video which I found very useful. After checking out the course content ,I saw the video content is of only 65 mins..
Do you think so little content is enough to atleast cover all the major aspects of value investing.? Also, if someone has a doubt can they connect with the mentor to clear their doubts? I agree, the content is not enough. This course is a great introduction to how value investing works. Over the next few months you will see more in-depth content added to it. You could perhaps join then? For questions, each video has a discussion under it so all your doubts can be cleared. a platform India can be proud of. And oh, we make up for some really heavy content on Value investing in the live classes. Those classes are gold. I think the universe heard my prayers. Your comment has made our day !! Actually im new to stock market & want to learn deeply & invest intelligently. Im just confirming what i think, would these courses be enogh for that? Despite Being A Sub-Broker Of Motilal Oswal, I Must Say Team Zerodha Is Doing Extra Ordinary. I Am Having Simultaneous Shocks(In A Good Way) From The Team. I Am Sure If Investor & Trader Education Goes At This Speed (Not Only Education But Everything You Offer) , Full Service Brokers Gonna Suffer (Incl. MOSL). I Am So Much Happy. Excellent job by Zerodha team. Will it be also available on app? Thank you so much Ravi. Yes the apps are under development currently. We will launch them soon. 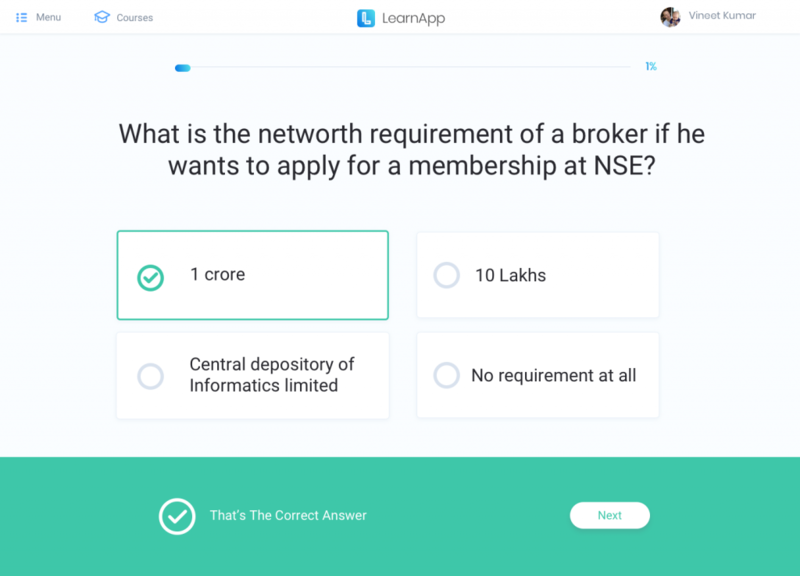 Please allow the zerodha account holders to use learnapp without any extra subscription charges. Hardik, thank you for your request. But do you see the price being a major obstacle to all the courses that LearnApp is providing? and which are usable to earn money. In the next 40 days we are releasing 3 strategies that can be followed, backtested thoroughly. The money part is completely dependent on your discipline and personality. I think a course can only give you 30% of what is needed to be successful. Love that you are responding to the comments. I have a question. Can I get one month access as I am Interested in the scalping class. I do not want the 3 month option as I will waste the opportunity and money. You will miss the live class though on Saturday by Bharadwaj but hopefully you will be able to attend the next if he decides to do one more. Are there any courses planned in Futures? I can see for options, but nothing for Futures. What kind of things would you like to be explored in the futures course? We are likely to start this soon. Futures, as you know is a different ball game altogether compared to cash market. Hence different strategies, OI movements, other Future specific parameters, entry/exit etc. the courses mentioned here are gonna helpful for a beginner or not? beginner in the sense just new to trading and just started leaning ABC of trading. I would recommend to take the trend trading course live class and video course then the rest. Sorry not teen trading…trend trading..
Great job Nithin & Team.I learned trading from varsity.video tut will helpful for all new comers to the trading world. Can I pay for the subscription amount from my zerodha kite free cash available balance ? Hey Deepak, apologies for missing your question. No, you cannot pay from your Kite account, head on to Learnapp’s website and use the payment gateway to enroll. I have just entered stock market a month back with zero knowledge. Studied something on technical analysis from varsity. Want to learn A-Z, whatever is mentioned here. Is it possible by enrolling here and of course dedicating the time. What are the pre- requisite. Totally right, infact the industry experts explain the basics really well. In upcoming courses we are diving deeper! Congrats and thanks a ton for this initiative. We can have coursed offered by many sites in the market but however not affordable for most of them. This step is in the right direction will cater to those groups who were looking for alternatives. So that will help people to choose the right path or courses. Jagadish! Wonderful suggestion. We will implement once we add the next 5 courses. We’ll also add a path so learners can start from basics and slowly move upwards. The dream is, affordable, best in class mentors and cutting edge content. The race is on! appreciate the work you are doing. can we have a DVD like thing as some of us may not be able to learn as fast as the youngsters not free but at the charges you fix after completing the course. 1. There is no way we can clear our doubts while watching recordings. I think there should be a way to ask questions even for offline viewers. It need not be answered live. 2. There should be some channel to talk to instructors. 3. There can be links to some useful sites/books related to sessions. Looking forward to your next classes. This is a really good suggestion, currently after 24 hrs the live class disappears. So perhaps the discussion should not be under that class. Maybe if we created a forum divided by say investing, trading etc? Perhaps that will solve this. Useful sites and books we will add in the existing course material for sure. Thank you for your review Vijay, we will implement! I have enrolled for learnapp. After I login and select the course; I don’t see the content all I see is Black screen and Ask a Question box active below. I had tried from Different browser (Chrome, Firefox from Laptop) and had also tried from Mobile. Hey Shankar, Thank you so much! Do you guys have an app for this? Hi Ashwini! Unfortunately we dont and the App development has not even begun yet. I am guessing it’s going to take a while. Android or iOS? where can I find the recorded video of live classes? If you have registered for a live class you will be able to see it on the live classes page. Thumbs up! Nice suggestion. Have shared with the team. Great job. But shouldn’t the live classes videos be available for review for subscribers till their subscription expires ? Interesting suggestion, we keep them for 24 hours so learners can review it by then. The class will repeat the next month allowing you to attend again.I’ll share your idea with the team, if we all agree – shall implement! I am not able to access learn app on mobile …. Sorry to hear that! send a screenshot to help [at] learnapp [dot] [co] along with the browser you use and what mobile manufacturer. We’ll get this solved asap! I wana knw about courses detail..do we get all type of course video access!? 2) Once you enrol you get full access to ALL videos and ALL live classes. 3) We try to add 3-4 courses every month. Zerodha is always famous for doing unique things for the client and employees and again zerodha proved this . Seriously waiting for this , thanks alot . From when September classes will start. I want to enrol for the courses. I believe many of you have already enrolled the course and watched the videos. Just wanted to know about the quality of knowledge delivered by the instructors. Have you applied the same knowledge in the trading sessions? what is the success count before this knowledge and after it? I hope it will be great for all who want this course based on your experiences. Thanks for reply. Hope this happens in october . I will subscribe shortly. First of all thank you, learn app was really helpful, actually I signed up for full year subscription when I heard of learning initiative called LearnApp in august. Also made few of my friends to sign up so that they don’t lose money!!!! Is it possible for you guys to include option class that talks about strategies that can be adjusted according to market conditions. More classes like David Sir’s. We have some nice option strategy live classes coming up. In addition to that we have an awesome course on option strategies coming up in the next 2 weeks. It’s a very detailed course on how to use spreads if you have a market view. We launch a new course every week, two brand new courses going live tonight. are these classes having specified courses/training on Commodity/Equity/derivate. etc respectively, & for intraday/long term stay etc. or been given same technical/fundamental analysis for all. Are there any benefits specific to Zerodha customer. I see prices are same irrespective whether you are Zerodha customer or not. Thanks for empowering us with another ingenious product, now in terms of training and knowledge. Zerodha varsity is my go to source of knowledge for all matters related to trading and investing. When my friends / relatives ask for any queries related to trading and investing, I redirect them to Zerodha Varsity without a second thought. Thank you K. Rangappa and N.Kamat! I genuinely wish and hope that in future Zerodha Varsity metamorphose itself into an interactive / animated medium. As a beginner, do I go to varsity first and then come here or can I directly start from here without going to varsity? I have learnt alot from Varsity myself. Would suggest you start there, Karthik is a genius! You can always join LearnApp after that. Ya its helpful .n I want to join, can I pay in instalment basis? We have only 3 month and 12 month plans. There is no offline viewing feature yet, but the videos stream pretty well and should not be an issue. Just no words, it’s now companies like JP Morgan, Wells Fargo would start hiring people who learnt from LearnApps rather than searching the talent in MBA colleges. Knowledge is now almost free for common man, this thing is sure to bring revolution in investing. Zerodha which is the best is adding the best. “Get one Month extra access if you subscribe after the trial and 3 months extra if you subscribe to the 12 month plan”. Does mean that existing subscribers period will also extended. I mean I have subscribed for an year, so my subscription time will also get extended by 3 months. I Think LearnApp will be a very good place to start learning about Markets. The Idea is very exciting. Great to hear from the legends. I hope there will be more Knowledge. hey !! can u please tell me when will the hindi dubbed version will be available??? hi…do i get all sessions previously done(recording) if i enroll next week….or only live n upcoming classes…? I m a user of Zerodha and all I expect from your platform for education is to create a Mock Kite app or set a mock section in the current kite app so that before getting into real trading user feels confident that he has the grasp of your app and the stock market, please create something like “moneybhai” from moneycontrol, but totally identical to Kite and bug free with all the features, not many of the brokers are doing this the right way. Create a perfect paper trading app. Thanks for the suggestion Karan. LearnApp most likely wont build a mock trading app. But I see the benefit of having something like that. yesterday on kite zerodha there was a link for 3 day trail for learnapp. Hi Vikas, visit the website and login using your Kite ID. You will automatically be given 3 days free access if you are a first time user. enjoy! I have seen the learnapp site. please tell in all video classes and all course how to use in live market. how to actually take trade to chose one stock. in sectors or many stocks how to identify them. please tell intraday trading videos. Hi Raja, we have a lot of topics being covered so please visit learnapp.co and see the video courses and live class section. When you enrol you get access to all content. We are very very thankful to you and team of zerodha for such a tremendous effort. As you are already providing us with the Knowledge of Stock Market, Fundamental Analysis, Technical, Future & Options and so on and now Z Connect Platform. Thank You So Much, Sir, for this. Last but not the Least – A very Special thanks to our mentor, our Guru Karthik Rangappa Sir. LearnApp’s subscription is Rs. 500 per month (quarterly or yearly plans) giving you access to all video content and live classes. Nothing needs to be paid after you have enrolled. We don’t provide a certificate right now but I promise, you will enjoy the classes 🙂 Also, doing certification courses is on our roadmap, but will take some time. Write an email to us help [at] learnapp [dot] co and we will respond! Hitesh, we have basic courses as well as more advanced ones. Since you have access to all courses after you join, you can find what interests you the most. The courses are built to be practical and useful in the real world 🙂 Enjoy! Why Bhardwaj classes are taken down scalping. He takes atleast 2 live classes every month, check the live class section to see when he is up next. Learnapp – Brilliant brilliant concept !! Please do more videos from Industry Experts, the knowledge they share is priceless.. Thank you Prateek and Learnapp! Please do more live classes on Algotrading and option writing.. When the next class of scalp trading is going to start?